You’ve probably got a project or two (or three or four?) on your wish list. Well, I’m happy to report I just finished one of mine. For awhile I’d been wanting to upcycle a tee, evidenced by the post I’d pinned from Oh Everythi ng Handmade, “DIY: Two Into One T-shirt.” The project looked adorable and alluringly simple. I didn’t take action, though, till I saw this month’s Sew the Show prompt from Alida Makes. First, let me introduce you to Sew the Show. Each month, sewing blogger Alida selects a TV show. She encourages readers to “put that Netflix addiction to good use” by re-imagining fashion inspired by it. What fun! What fashion comes to your mind when you think of Friends? Floral dresses with cropped jean jackets? Overalls? Tank dresses? Funny, the first thing I thought of was t-shirts. Seriously. Everybody on that show knew how to rock a simple tee. So I set out on my mission. If you’d like to try this at home, here are the steps I followed. When looking for inspiration, I zoned in on Monica. Her style strikes me as clean, tailored, and sporty. (I’d like to think that describes my aesthetic, too.) I wanted to incorporate stripes, so when I found this red top of Monica’s, a vision for my project took shape. Off to the thrift shops I went. My plan was simple: Look for 3 or 4 shirts of the same size and weight that matched the colors in Monica’s top: red, grey, black, and maybe white. Execution turned out to be way harder than that, as I couldn’t find what I wanted. By the third shop I visited, I admitted it was time to let go of the strict color palette. (Fortunately, I live within a few minutes’ drive of several second-hand stores.) I’d stick to size, but I’d open the search to any colors I liked that would work together. With right sides facing each other, pin the edges together all around the shirt. (In other words, make sure the outsides of both shirts are facing each other as you pin.) 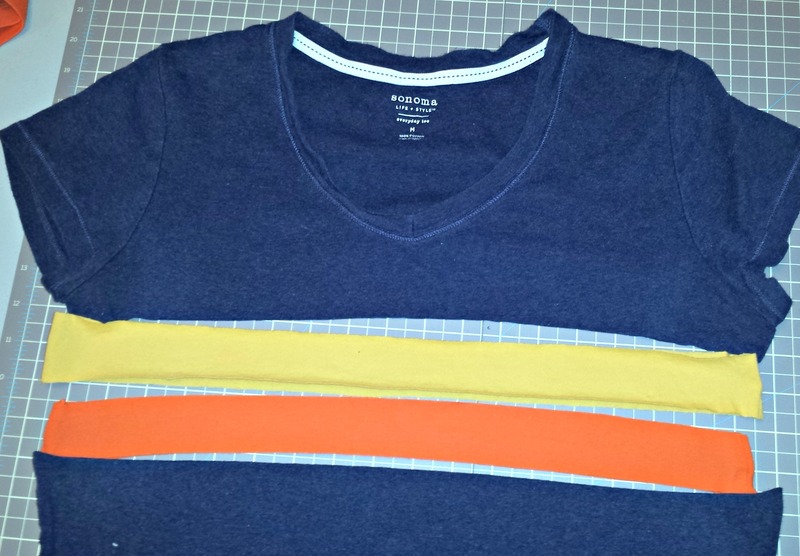 In the shots below, I’d already sewn the yellow stripe to the blue, and now I was pinning orange to yellow. Note that my pins have a tiny button decoration on them. (No, there are not actual buttons on the shirt.) Also, if you look closely you’ll see that perfect sewing wasn’t my goal here. I wanted a fun project I could start and finish in a weekend. Go ahead, try it yourself! This turned out to be a quick project, and I was having fun with it. So I went ahead and made three versions. What I liked most was the sheer number of possibilities! Combining solids was as simple as attaching stripes of different sizes. Next time, I may try mixing prints or graphics for a funkier look. Or letting the shirts I discover dictate the direction. How would you adapt your own tees? Thanks for the inspiration, fellow bloggers! Why, yes, that is an oversized coffee mug. Surely the Friends themselves would appreciate it. When’s the last time you lolled away an afternoon with friends, making crafts and having snacks? If you don’t have an answer, then it’s been too long. Take a page from my friend Heidi’s playbook, and start hosting Crafternoon. Last year she began these monthly Sunday gatherings as a present to herself on her birthday. (Don’t tell her this, but in the end we’re the ones who got the gift.) The format’s pretty simple: Invite a few friends over and provide treats. Tell everybody to bring a project and that anything goes. In my experience, anywhere from two to five people show up, and no two gatherings are the same. Here’s what happened this month. Pull up a chair and join us. Bree appreciates a project that allows her to follow instructions to the letter. Her brother can rest assured she’s getting the colors just right. It turns out Bree’s brother is a Doctor Who fan. Along with BBC lovers across the globe, he knows all about The Doctor’s legendary scarf, which–depending on the episode–has ranged from 6 to 14 feet long. (Correct me, die-hards, if I have these numbers wrong.) Naturally, Bree’s brother will be the recipient of her eventual scarf. Well played, I say: Way to combine a hard-core winter project with an amusing gift! Heidi’s a reader and a history buff. And let me just warn you now. Most of you probably don’t want to go head-to-head with her in a U.S. presidential trivia contest. If you’re one of her Facebook friends, you receive updates on each president’s birthdays, complete with a historic photo. Sorry, President McKinley. The FB crowd can be pretty harsh. To be fair, your eyebrows do resemble Sam Eagle’s from The Muppet Show. But Heidi brings up a good point. You deserve to catch a break, since you were the last president to serve in the American Civil War, then got assassinated while in office. So Jill and I know each other solely through Crafternoon. Even on the first day we both showed up, we had no trouble covering topics from books (her habit of researching scientific topics that appear in novels) to divorce (mine from a few years back, a story for another post). Jill usually has a sketchbook in hand, and it wasn’t till this meeting that I learned she’s a legit designer with a blog of her own. soon-to-be regular feature, Be Good To You Today. So, how do you connect with your own community, crafting or otherwise?